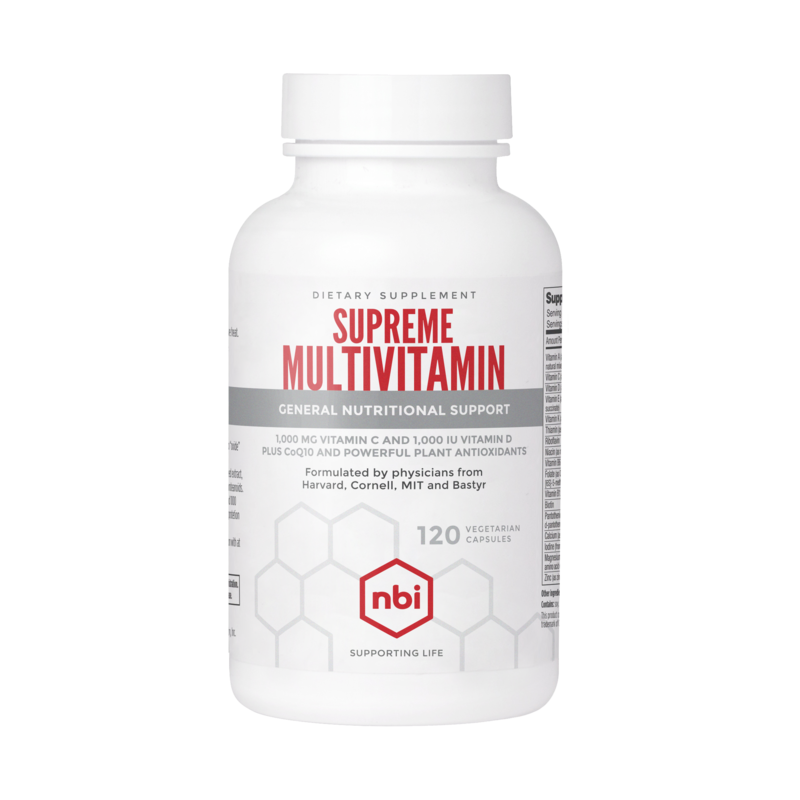 Supreme Multivitamin is manufactured to the highest industry standards. It comes in capsules, contains no binders and only the most absorbable forms of minerals. It also contains the highest amounts vitamin D, vitamin C, B-complex vitamins, minerals and additional nutrients available in one product. 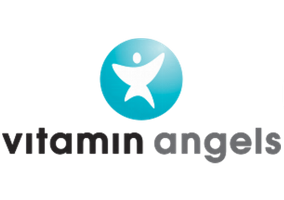 The most popular multivitamin contain low amounts of, and poorly absorbed, nutrients. 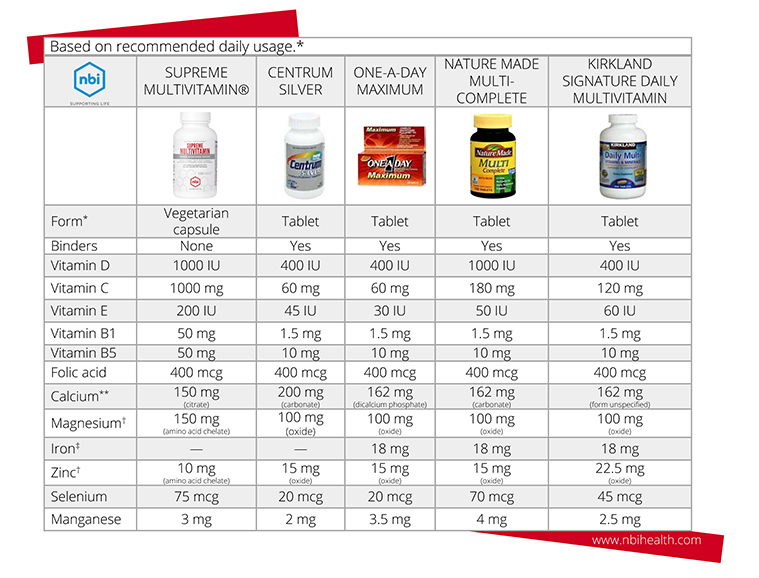 This includes Centrum Silver, One-A-Day Maximum, Multi-Complete and Kirkland Signature Daily Multivitamin. 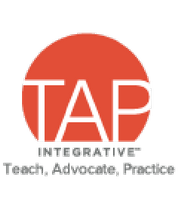 **Tablets versus capsules. Tablets are generally more difficult to break apart in your stomach because they contain binders that hold it together. These pills can go right through you without being dissolved or absorbed. While not all tablets have this problem, it would be extremely difficult for the general consumer to know if any one tablet is good or not. But capsules don’t have this problem. They are superior to tablets. Always buy capsules if you can. †Calcium. Calcium carbonate is poorly absorbed. The most absorbable form of calcium is calcium citrate. ††Magnesium and Zinc. The “oxide” form of minerals, such as magnesium and zinc, is an inferior form of mineral. The body can only absorb 2% of the magnesium when it’s in the oxide form. Even though it says you’re getting 100 mg magnesium, your body can only absorb about 2 mg. The rest passes right through you and out your stool. ‡Iron. It is recommended by medical professionals that men and post-menopausal women avoid dietary supplements containing iron. This is because it puts them at risk for a condition called “iron overload.” This is a potentially dangerous situation that can cause damage to kidneys, pancreas, liver, the heart and other organs. Money’s Worth in a Multivitamin? Is it a tablet or capsule? Tablets are generally more difficult to break apart in your stomach because they contain binders that hold it together. These pills can go right through you without being dissolved or absorbed. While not all tablets have this problem, it would be extremely difficult for the general consumer to know if any one tablet is good or not. But capsules don’t have this problem. 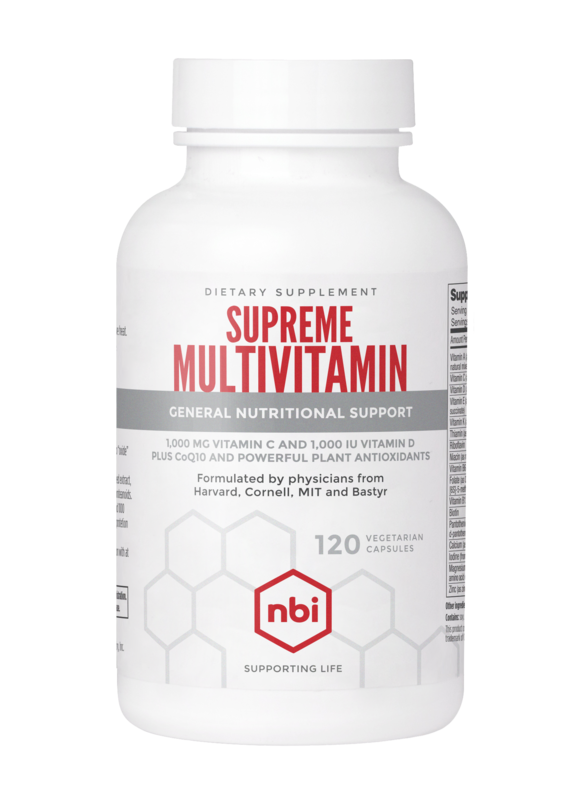 They are superior to tablets, and why NBI’s Supreme Multivitamin comes in vegetarian cellulose capsules. Always buy capsules if you can. Is it a one-a-day multivitamin? If it is, then you’re pretty much guaranteed it’s garbage. This is because companies have to squeeze and bind all the nutrients together in the tablet. To do so they tend to use forms of minerals that are poorly absorbed, which is a good lead into the next question. 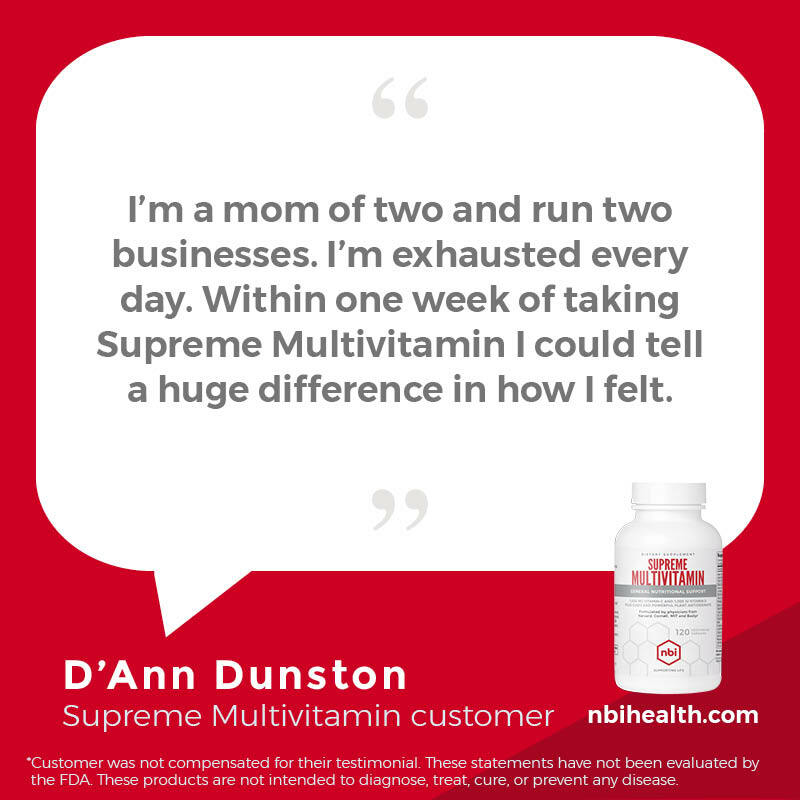 This is why NBI’s Supreme Multivitamin requires people take multiple capsules each day. Does it contain highly-absorbable nutrients? Companies use poorly absorbed nutrients because they are less expensive. They also know that they can get away with it because most consumers shop just on price. They don’t understand that most of what they’re buying is likely not even being absorbed. If it’s a once-daily tablet then the product likely contains nutrients that can’t be absorbed. Simply look at the Supplements Facts label on the bottle. This is where each ingredient is listed in detail. Find magnesium, calcium, zinc and copper. If calcium is calcium carbonate, or if any of the other minerals are “oxides” (e.g., magnesium oxide, copper oxide), then it’s a poor quality formula and not worth your money. The oxide forms of these minerals are poorly absorbed. In fact, you can only absorb about two percent of magnesium when it’s in the oxide form. So if the bottle lists one hundred milligrams magnesium (as magnesium oxide), then you’re actually only absorbing about two milligrams. The remaining ninety eight milligrams just pass right through you. Magnesium in an oxide form is so poorly absorbed that in higher doses it’s a laxative. Companies use the oxide form of minerals because they’re cheap. But you’d be better off eating a few spinach leaves than wasting your money on a dietary supplement that contains minerals in their oxide forms. Instead, the most absorbable form of minerals are the amino acid chelated forms. A chelate is a mineral combined with an amino acid such as citrate, malate or aspartate. Amino acid chelated minerals are easier for the body to absorb and can increase absorption to 75%. If you really want your money’s worth, only buy products that contain all their minerals as amino acid chelates (eg, magnesium amino acid chelate). Calcium, found in all multivitamins and calcium supplements, is a little different. It doesn’t come in an oxide form. Instead, most products contain calcium carbonate (this includes coral calcium). It’s a large molecule with a lot of elemental calcium. But its size makes it difficult to absorb and can be constipating. 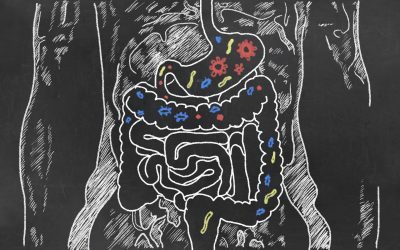 Stomach acid is required to absorb calcium carbonate. But as people age they tend to produce less stomach acid. 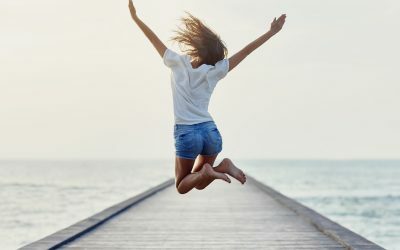 Up to twenty-one percent of people sixty to sixty-nine years old, thirty-one percent of those seventy to seventy-nine years old, and thirty-seven percent of those above the age of eighty have hypochlorhydria (low stomach acid) or achlorhydria (no stomach acid). Just when people need the calcium most as they age and take osteoporosis supplements to protect their bones they’re absorbing lessand less of this essential mineral. In contrast, calcium citrate or malate is smaller, easier to absorb and doesn’t require stomach acid. The most absorbable forms of minerals are listed as an “amino acid chelate,” or as citrate, malate, aspartate or asporotate. Only buy supplements that contain these forms of minerals. The dietary supplement aisle is confusing for most people, and manufacturers know this. That’s why people largely shop just on price. They buy the least expensive bottle possible. In doing so they’re flushing their money down the toilet. Be a savvy consumer. Look at your dietary supplement and ask these questions. You’ll be getting a better value for your money by buying quality. 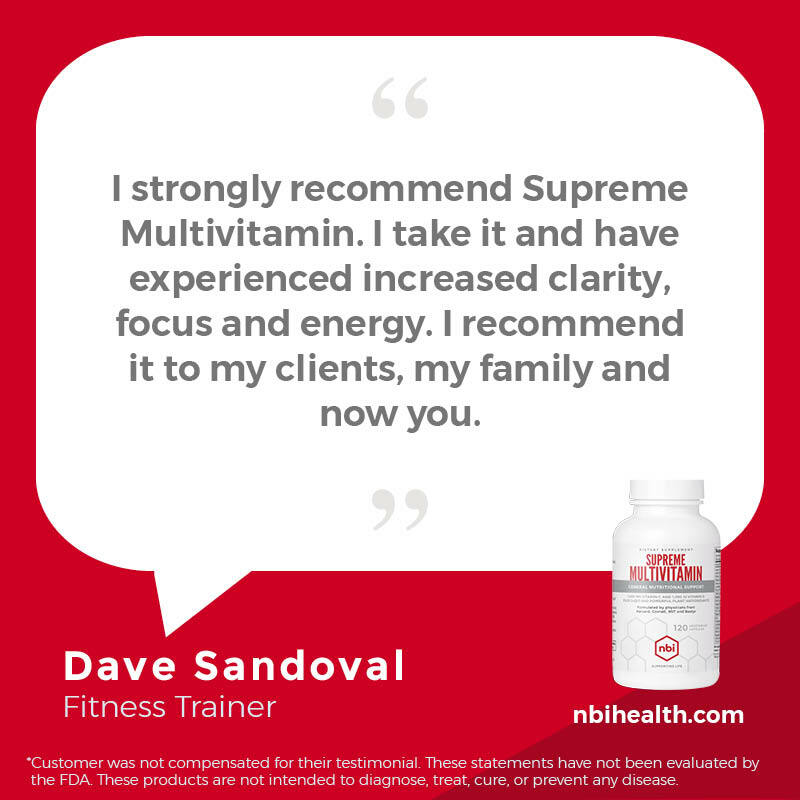 This is why NBI’s Supreme Multivitamin contains only amino acid chelated minerals and calcium citrate. 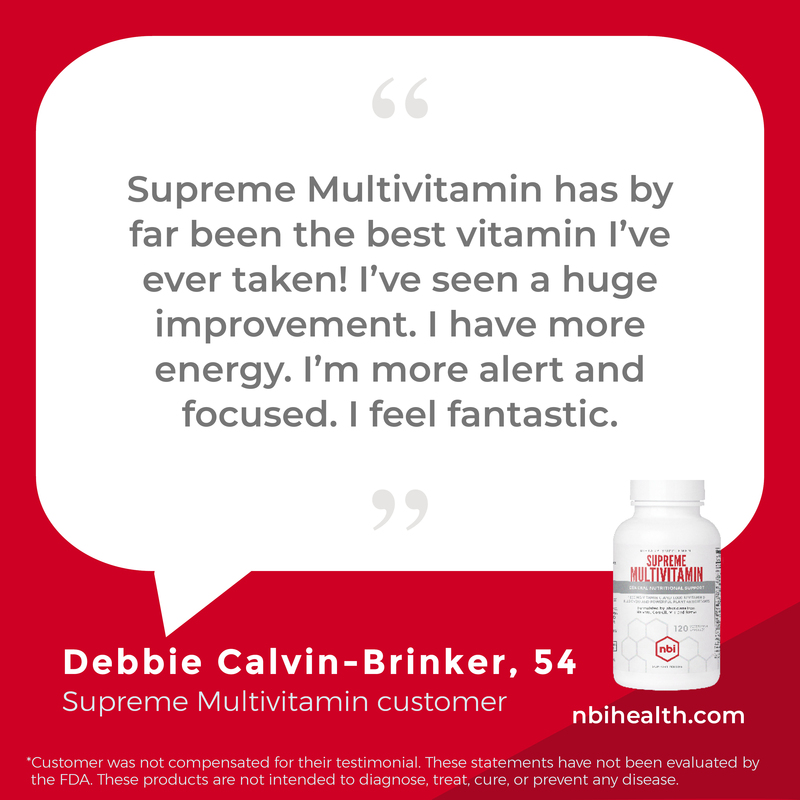 How does Supreme Multivitamin compare? Supreme Mulitivitamin is manufactured to the highest industry standards. It comes in capsules, contains no binders and only the most absorbable forms of minerals. 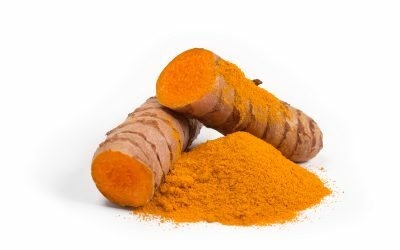 As important, it contains the highest amounts vitamin D, vitamin C, B-complex vitamins, minerals and additional nutrients available in one product. NBI also ensures each nutrient is tested for contaminants and shown to exceed FDA standards. 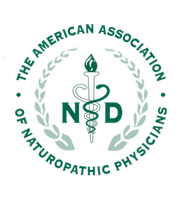 Additionally, all NBI products are manufactured at a GMP-certified, FDA registered manufacturing company that also manufactures pharmaceuticals. This ensures that NBI products actually conform to pharmaceutical grade manufacturing standards. Finally, NBI stands behind every one of its products with an unconditional money-back guarantee. 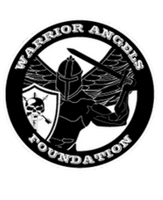 No other company provides this level of quality and assurance. But if you don’t mind taking more capsules (6 per day in Osteo-K versus 4 per day in Osteo-K Minis), doesn’t bother you and you like the idea of getting more calcium in your dietary supplement, then the original Osteo-K formula is for you.